Obama Praises And Challenges Cubans In Speech In Havana : The Two-Way In his history-making visit to the island, the U.S. president talked about Cuba's international contributions, and urged young people to build and benefit from a democracy. 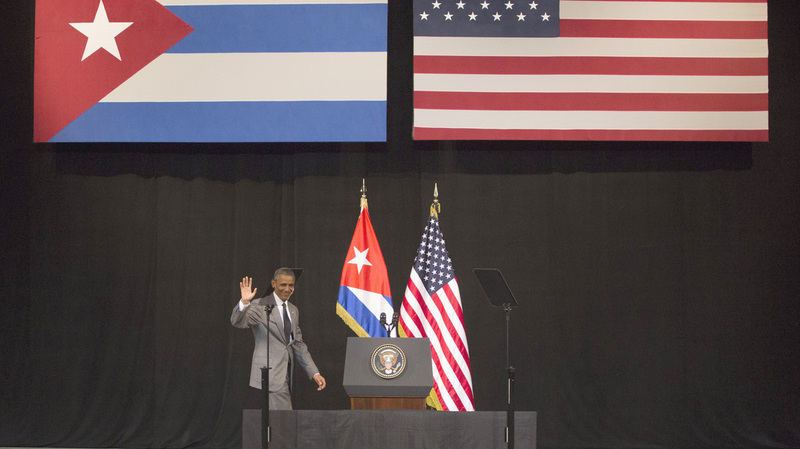 President Obama arrives at the podium to address the Cuban people at the National Theater in Havana on Tuesday. He said the two countries should let go of the past and benefit from better relations in the future. President Obama's speech to the Cuban people, delivered live from the Gran Teatro in Havana, presented both a risk and an opportunity. He did not want to suggest any endorsement of a system that for more than 50 years has been associated with the suppression of democratic freedoms and human rights. On the other hand, with Raul Castro listening intently from his front row seat in the balcony and Cubans across the island watching on their televisions, Obama was in a position to deliver a message no previous U.S. president could have managed, one that could help heal the long break between the countries. It was clearly a moment he has long anticipated. In April 2009, three months after taking office, Obama said he was committed to "a new beginning" with Cuba. "We are not dug into policies that were formulated before I was born," he said at the time. He returned to that theme in Havana, noting that the 1961 Bay of Pigs invasion, when U.S.-trained Cuban exiles attempted to overthrow Fidel Castro's government, took place the year of his birth. He absolved himself by virtue of his youth. "I know the history, but I refuse to be trapped by it," he said. He chose instead to focus on an earlier period, when the Cuban people fought for their independence from Spain, in part from a base of support in the United States. The ambivalence Cuban nationalists have had for the United States dates from that period, as Obama acknowledged when he noted that the American battleships that crossed the Florida Straits in 1898 came "to liberate, but also to exert control over Cuba." The war for Cuban independence, which came to be known in the United States as the Spanish-American War, ended with a U.S. military occupation of the island. Break the heart by which I live. On the tough issues, Obama spoke carefully, attempting to be honest in his assessment of Cuban shortcomings but also offering some conciliatory words. He spoke positively of the 1 million or so Cuban exiles who fled their homeland, though without quite acknowledging the reasons they left. He described Cuban schooling as "an extraordinary resource — a system of education that values every boy and every girl," though those Cuban children are hardly trained to be critical thinkers. Books with ideas considered subversive are banned from the classroom, and schoolchildren are taught to chant, "Seremos como el Che!" We will be like Che (Guevara, the legendary guerrilla). He had praise for Cuba's role in the world, saying "No one should deny the service that thousands of Cuban doctors have delivered for the poor and suffering," citing the Cuban effort to help stamp out Ebola in West Africa as an example. He did not mention that the deployment of Cuban doctors on international missions is in part a for-profit venture that brings the Cuban government much needed hard currency. On the other hand, Obama spoke boldly of the importance of political freedom. In what was the strongest section of his speech, Obama pointed out that the progress made in America in race relations and social justice was precisely the result of American democracy. "The fact that we have open debates within America's own democracy is what allows us to get better," he said. "People organized; they protested; they debated these issues; they challenged government officials." Those words certainly must have irritated Raul Castro and his other government hosts and encouraged those Cubans who are working for political change on their island. Finally, Obama appealed directly to Cuban youth, essentially ignoring the island's geriatric leadership. "There's already an evolution taking place inside of Cuba, a generational change," he said. "Many suggested that I come here and ask the people of Cuba to tear something down. But I'm appealing to the young people of Cuba who will lift something up, build something new. El futuro de Cuba tiene que estar en las manos del pueblo Cubano." The future of Cuba has to be in the hands of the Cuban people.